Investigate a necromancer cult searching for a long-dead Dragon. According to the Undaunted Trailblazer, Yisareh, the ruins of Fang Lair have been taken over by a cult of necromancers who are preparing for something big. She's enlisted my help in discovering and foiling their plans. Yisareh said that a magical barrier is preventing her from delving deeper into Fang Lair. I need to find it and disrupt it. The barrier is being maintained by Lizabet Charnus [sic], a powerful necromancer in the service of this cult's unseen master. Defeating her should bring down the barrier blocking our path. I brought down the barrier preventing our passage into Fang Lair. Yisareh asked me to take the lead and seek out an area where the necromancers practice their craft. Their research may provide some insight into their motives. I discovered a menagerie of skeletal beasts on display, but their unseen master reanimated them to bar my path. I need to destroy them before Yisareh and I can investigate further. I destroyed the undead menagerie, but Yisareh seemed puzzled as to why the necromancers would be studying animal bones. She asked me to press onward while she digs into their research. The master of the necromancer cult has more than mindless undead at his disposal. He commanded a lich named Caluurion to kill me and now I must destroy him or risk finding myself and undead thrall as well. Yisareh was able to speak to Caluurion's spirit after I defeated him. He has no love for the necromancer who bound him to his will and agreed to help us if we free his allies as well. Now I have to find them. I found a pair of powerful undead I believe to be Caluurion's allies. To free them from their unwilling service to the necromancers I will have to destroy them. I freed Ulfnor and Sabina from Orryn's control. They confirmed that the necromancers intend to reanimate the Dragon. I must find Orryn and prevent him from completing his ritual. 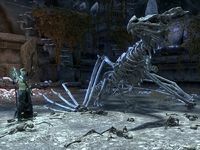 Finishes quest I killed Orryn the Black and destroyed his bone dragon, putting an end to the threat he and his cult posed to Tamriel. I should speak to Yisareh about our success.